PM #40762529 $5.00 • Vol. 29, No. 17 May 14, 2018 L AW TIMES C O V E R I N G O N T A R I O ' S L E G A L S C E N E • W W W . L A W T I M E S N E W S . C O M Duty of care must be scrutinized, says OCA Marie-Andrée Vermette says the Court of Appeal is trying to bring 'rigour' to the duty of care analysis. Photo: Robin Kuniski NO DOCUMENTS Victim can't use materials for claim P5 RYERSON LAW Provides beneficial disruption P7 FOCUS ON Cybersecurity & Mobile Technology Law P8 BY SHANNON KARI For Law Times T he full extent or scope of any duty of care that is owed by a defendant must be carefully scruti- nized when deciding what types of damages may apply to this duty, the Ontario Court of Appeal has stressed in a class action case relat- ed to the 2008 listeriosis outbreak. The decision in 1688782 On- tario Inc. v. Maple Leaf Foods Inc. is also the first appellate court ruling since the Supreme Court of Canada clarified the approach to identifying a duty of care last De- cember in Deloitte & Touche v. Livent Inc. In its decision, issued April 30, the Court of Appeal overturned the motions judge and found that any duty Maple Leaf had in sup- plying safe "ready-to-eat" meats to Mr. Sub franchises did not extend to economic losses suffered as a re- sult of publicity from the recall of certain products at the time of the outbreak. The ruling effectively reduces the class action filed by franchise owners of the submarine sandwich chain to a few minor grounds. "There was an error in failing to consider the scope of the proxi- mate relationship between the parties, which in turn affected the foreseeability analysis," wrote Jus- tice Michal Fairburn with justices Robert Sharpe and Paul Rouleau concurring. "Maple Leaf undoubtedly un- dertook — in the context of its contractual relationship with the franchisor — to supply meat safe for human consumption by Mr. Sub customers. The nature or pur- pose of such an undertaking was to ensure that Mr. Sub custom- ers who ate [ready-to-eat] meats would not become ill or die as re- sult of eating the meats. The pur- pose of the undertaking was not, however, to protect the reputa- tional interests of the franchisees," Fairburn stated. Peter Kryworuk, lead counsel for the franchisees at the Court of Appeal, says the ruling is be- ing reviewed to decide whether to seek leave to appeal to the Supreme Court. "This decision is significant with respect to the duty of care. It takes a very narrow and restrictive approach to the proximity analy- sis," says Kryworuk, a partner at Lerners LLP in London, Ont. 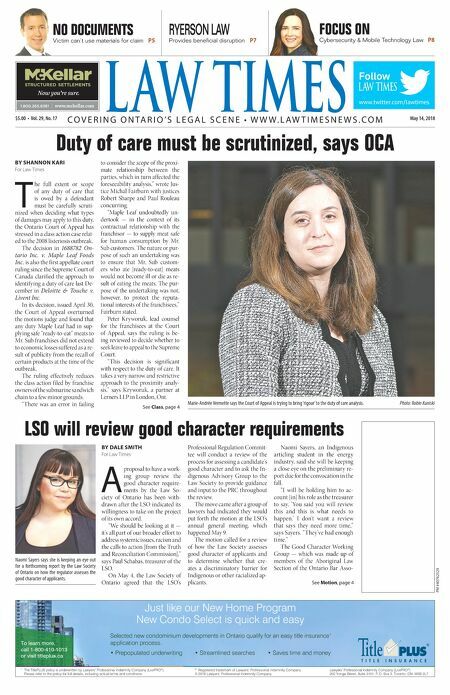 See Class, page 4 LSO will review good character requirements BY DALE SMITH For Law Times A proposal to have a work- ing group review the good character require- ments by the Law So- ciety of Ontario has been with- drawn after the LSO indicated its willingness to take on the project of its own accord. "We should be looking at it — it's all part of our broader effort to address systemic issues, racism and the calls to action [from the Truth and Reconciliation Commission]," says Paul Schabas, treasurer of the LSO. On May 4, the Law Society of Ontario agreed that the LSO's Professional Regulation Commit- tee will conduct a review of the process for assessing a candidate's good character and to ask the In- digenous Advisory Group to the Law Society to provide guidance and input to the PRC throughout the review. The move came after a group of lawyers had indicated they would put forth the motion at the LSO's annual general meeting, which happened May 9. The motion called for a review of how the Law Society assesses good character of applicants and to determine whether that cre- ates a discriminatory barrier for Indigenous or other racialized ap- plicants. Naomi Sayers, an Indigenous articling student in the energy industry, said she will be keeping a close eye on the preliminary re- port due for the convocation in the fall. "I will be holding him to ac- count [in] his role as the treasurer to say, 'You said you will review this and this is what needs to happen.' I don't want a review that says they need more time," says Sayers. "They've had enough time." The Good Character Working Group — which was made up of members of the Aboriginal Law Section of the Ontario Bar Asso- See Motion, page 4 www.twitter.com/lawtimes Follow & $#&!&jmmm$cYa[bbWh$Yec ntitled-4 1 12-03-20 10:44 AM Just like our New Home Program New Condo Select is quick and easy Selected new condominium developments in Ontario qualify for an easy title insurance 1 application process. 1 The TitlePLUS policy is underwritten by Lawyers' Professional Indemnity Company (LAWPRO ® ). Please refer to the policy for full details, including actual terms and conditions. To learn more, call 1-800-410-1013 or visit titleplus.ca ® Registered trademark of Lawyers' Professional Indemnity Company. © 2018 Lawyers' Professional Indemnity Company Lawyers' Professional Indemnity Company (LAWPRO ® ) 250 Yonge Street, Suite 3101, P.O. Box 3, Toronto, ON M5B 2L7 • Prepopulated underwriting • Streamlined searches • Saves time and money 1 The TitlePLUS policy is underwritten by Lawyers' Professional Indemnity Company (LAWPRO ® ). Please refer to the policy for full details, including actual terms and conditions. ® Registered trademark of Lawyers' Professional Indemnity Company. © 2018 Lawyers' Professional Indemnity Company Lawyers' Professional Indemnity Company (LAWPRO ® ) 250 Yonge Street, Suite 3101, P.O. Box 3, Toronto, ON M5B 2L7 TitlePlus_LT_May14_18.indd 1 2018-05-09 11:04 AM Naomi Sayers says she is keeping an eye out for a forthcoming report by the Law Society of Ontario on how the regulator assesses the good character of applicants.